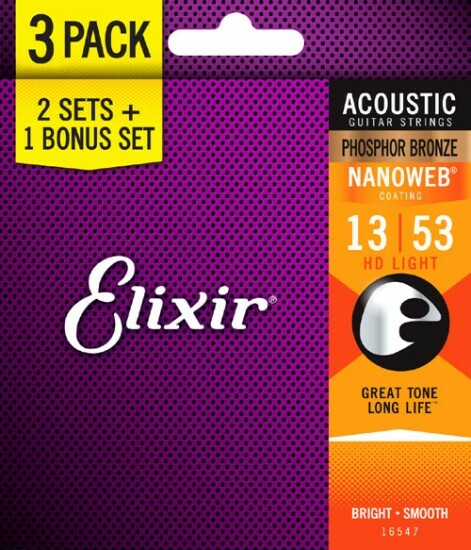 Elixir 16547 Nanoweb Coated Phosphor Bronze Acoustic HD Lt 13-53 3-PACK - BUY 2 SETS GET 1 FREE! You guys do a great job!! While developed for Taylor guitars, these strings are a nice option for traditional Dreadnought models from any mfg. Standard light gauge strings can lose a bit of treble sparkle when trying to move a large Dreadnought soundboard, but the higher gauge on this "HD Light" set (maintaining standard Light gauge on the 3 bass side strings) creates a nice balance (without over-booming the bass if you were using standard "medium" gauge strings). I also chose this set since I repaired two treble side cracks on an older Epiphone Masterbilt guitar (all solid tone woods) and wanted more power on the treble side to compensate for any dampening created by repair cleats. Worked perfectly. As always, it was easy to learn about these strings on Strings By Mail website plus get great pricing and very fast shipment! Thanks! Strings are great but packed in bulk rather than boxed by set.